The other day I was thumbing through my vertical file cabinet and tucked away was this postcard. I have a vague recollection of receiving it from a first cousin once removed. 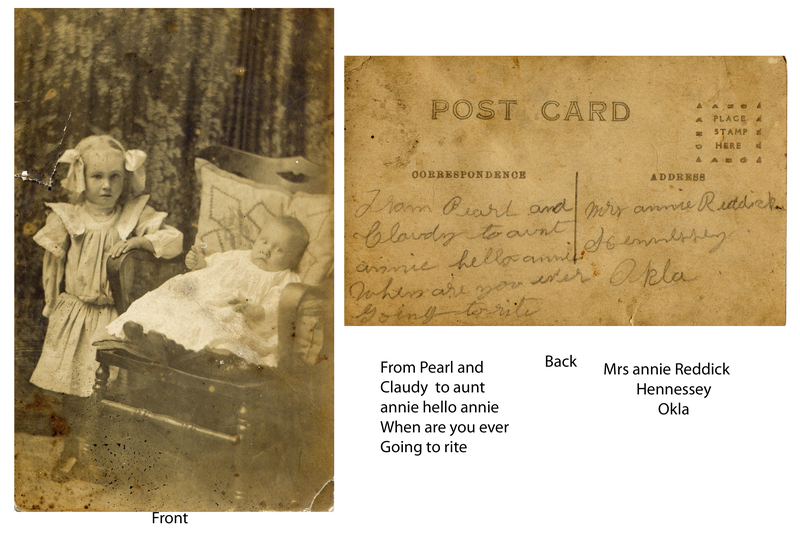 I must not have attempted to read the postcard when I got it or it would not have been in that cabinet because the baby is my Grandpa Brown. I’m guessing that the note on this postcard was written by my great Grandmother Ella Brown to her sister-in-law. It tickles me to read this, I don’t often think of humor playing a big part in the hard lives that many of my ancestors had and this, to me, shows a fun moment of a proud mother. My Grandpa, Claude Brown, was born in 1909 in Southard, Blaine County, Oklahoma and was the second of six children born to John and Ella Brown.